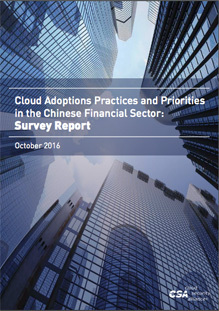 We circulated the “Financial Services Industry Cloud Adoption Survey: China” survey to IT and security professionals in the Financial Services Institutions (FSIs) in China. The goal was not only to raise awareness around Cloud service adoption, but also to provide insight into how finance, government, insurance, and security decision makers take action in their organization within China. 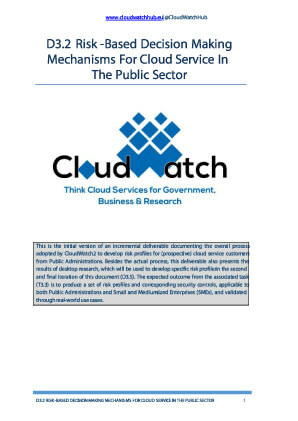 These actions included consolidating and standardizing the most secure Cloud services, knowing what policies would have the most impact as well as understanding where to focus for educating users. 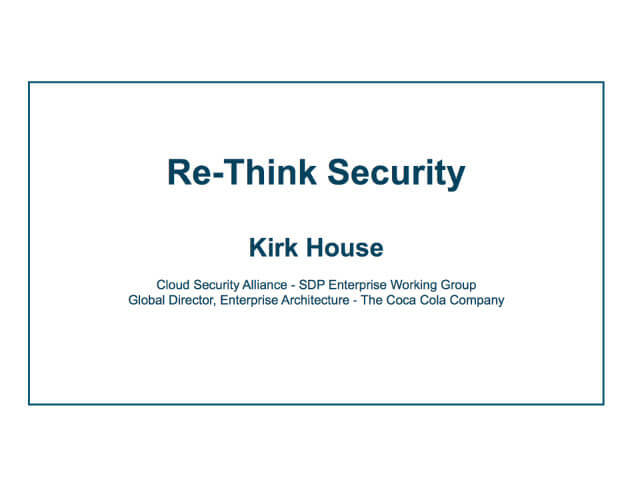 With several years of cloud adoption in organizations, approaches to security have been evolving rapidly. 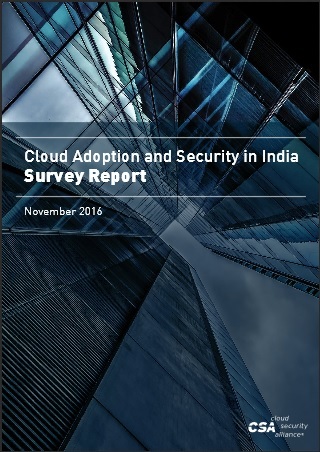 To dig deeper into these concerns and the controls being used to mitigate both sanctioned and unsanctioned cloud security risks, the Cloud Security Alliance and Bitglass conducted a survey of 176 IT security leaders. 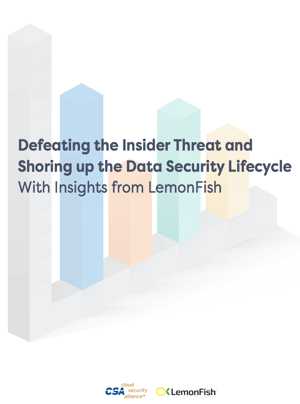 Respondents revealed that visibility and control remain major issues for many organizations. In fact, more than half do not have adequate visibility and have experienced a security incident due to lack of appropriate controls. Based o_x001F_ of our responses approximately 93 percent of individuals are still concerned about shadow IT compared to this time last year. On the topic of whether cloud vendors should be forced to cooperate with government requests for data, just over half opposed to cooperation. 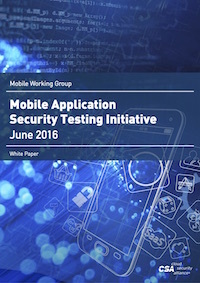 Mobile application security testing and vetting processes utilized through MAST involve both static and dynamic analyses to evaluate security vulnerabilities of mobile applications for platforms such as Android, iOS and Windows. 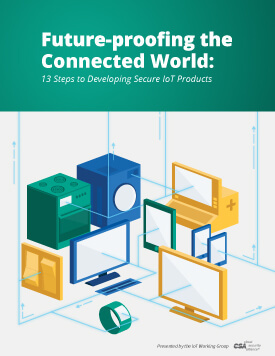 These processes cover permissions, exposed communications, potentially dangerous functionality, application collusion, obfuscation, excessive power consumption and traditional software vulnerabilities. 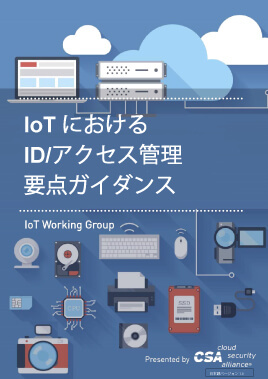 It also covers internal communications such as debug flag and activities and external communications such as GPS, NFC access as well as checking the links that are written in the source code. 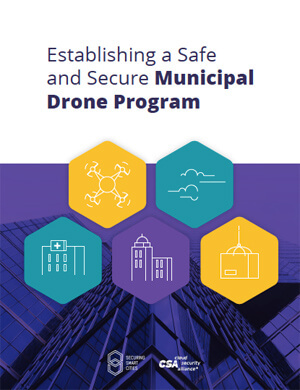 In addition to security testing and vetting, the initiative has also proposed processes and procedures for security incidence response. The use of mobile applications has become unavoidable, almost a necessity, in today's world. More people are starting to question the security of mobile applications and it's about time that you take a look at what the Cloud Security Alliance has to say about mobile application security! A random number is generated by a process whose outcome is unpredictable, and which cannot be reliably reproduced. Randomness, quantitatively measured by entropy, is the measure of uncertainty or disorder within a set of data. The higher the level of unpredictability, the more random the data is and the more valuable it becomes, particularly for cryptographic operations. 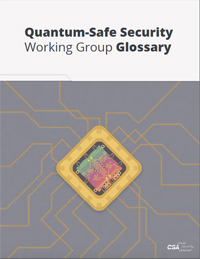 In this report from CSA's Quantum-Safe Security Working Group, Quantum Random Number Generators will go over the impacts of randomness on security. For security or other applications where high quality randomness is needed, physical approaches are taken to generate random bits. 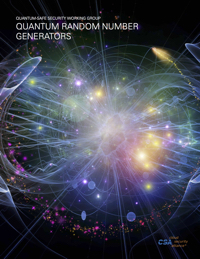 Generators based on quantum physical processes deliver the highest quality random data. Contrary to classical physics, quantum physics is fundamentally random. 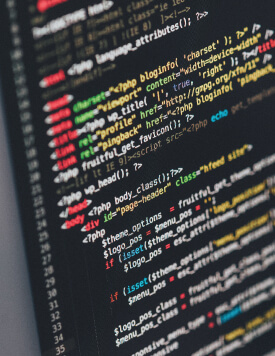 Given the incomparable quality of the entropy delivered by such solutions, and their commercial viability, the challenges of selecting random number generators that will not expose your data to breaches has suddenly become much simpler. In fact, the question “What source of random should I use” has a simple, safe and commercially viable answer: Use Quantum! 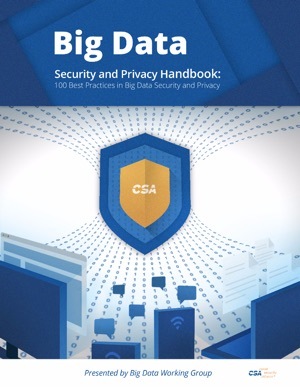 The Cloud Security Alliance (CSA) Security, Trust and Assurance Registry (STAR) program is the industry’s leading trust mark for cloud security. 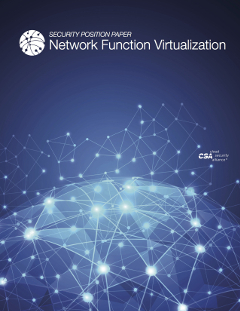 The CSA Open Certification Framework (OCF) is a program for flexible, incremental and multi-layered CSP certifications according to the CSA’s industry leading security guidance. 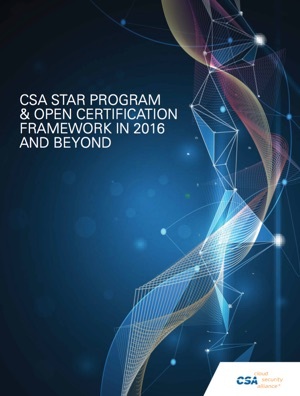 The OCF/STAR program comprises a global cloud computing assurance framework with a scope of capabilities, flexibility of execution, and completeness of vision that far exceeds the risk and compliance objectives of other security audit and certification programs. 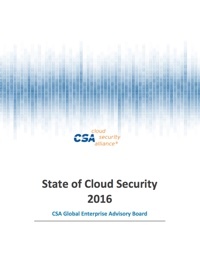 “The Treacherous 12 - Cloud Computing Top Threats in 2016” plays a crucial role in the CSA research ecosystem. 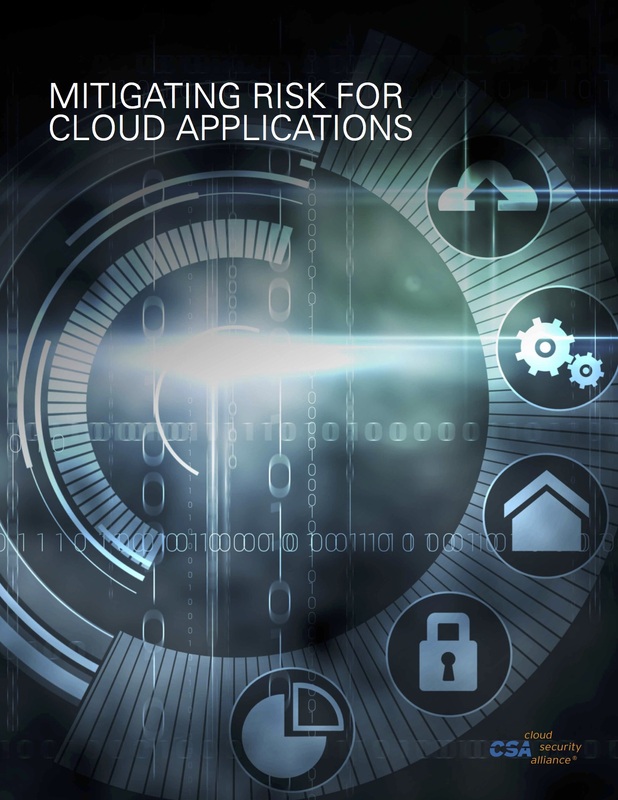 The purpose of the report is to provide organizations with an up-to-date, expert-informed understanding of cloud security concerns in order to make educated risk-management decisions regarding cloud adoption strategies. 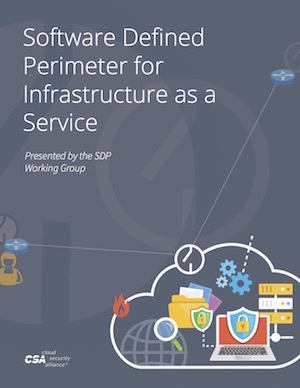 The report reflects the current consensus among security experts in CSA community about the most significant security issues in the cloud. 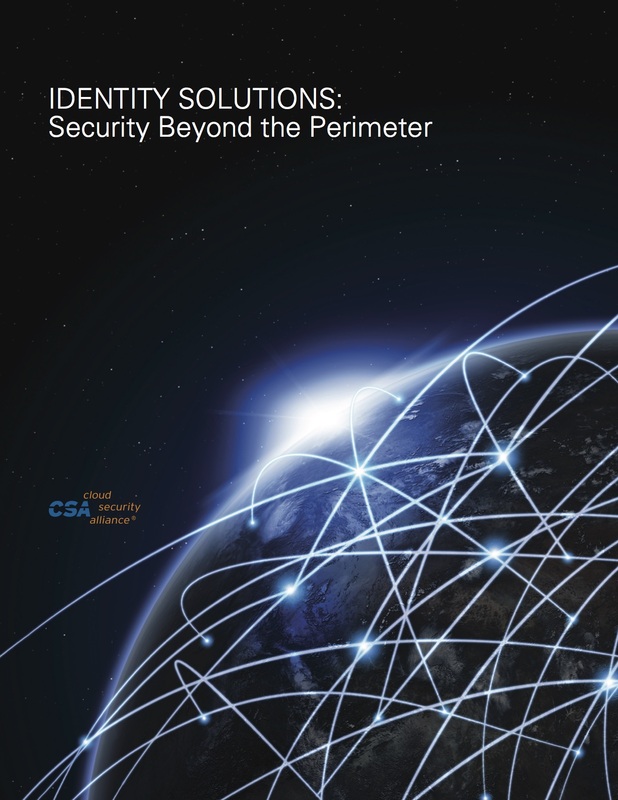 Realigns the CAIQ questions to CCM v3.0.1 control domains and the Cloud Security Alliance "Security Guidance for Critical Areas of Focus in Cloud Computing V3.0"
Cloud Adoption does not have to mean opening up your organization to increased security risks and threats if the right policies are in place. 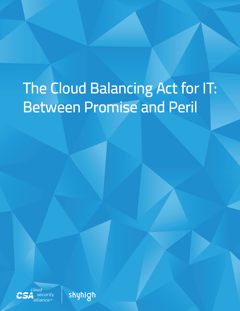 That’s what the findings from a new Cloud Security Alliance (CSA) survey, titled The Cloud Balancing Act for IT: Between Promise and Peril, indicated when it surveyed executives and IT managers worldwide. 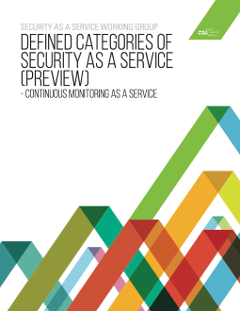 Security professionals indicated receiving, on average, 10.6 requests each month for new cloud services. Perhaps that’s why 71.2% of companies now have a formal process for users to request new cloud services.